Some guy on the YouTubes looked at the creek flowing through his property and said, “I wanna get some use out of that water, and I’m gonna make me some power.” In what can only be described as pure genius, he cobbled up an alternator, a wheel bearing, a wire spool, a bicycle wheel and a few other things, and built his own hydroelectric power source. He is my hero. I don’t know much about this video, though after stalking Off Road/Off Grid’s YouTube page, and reading all of his comments, I’ve surmised that he lives in Kentucky. 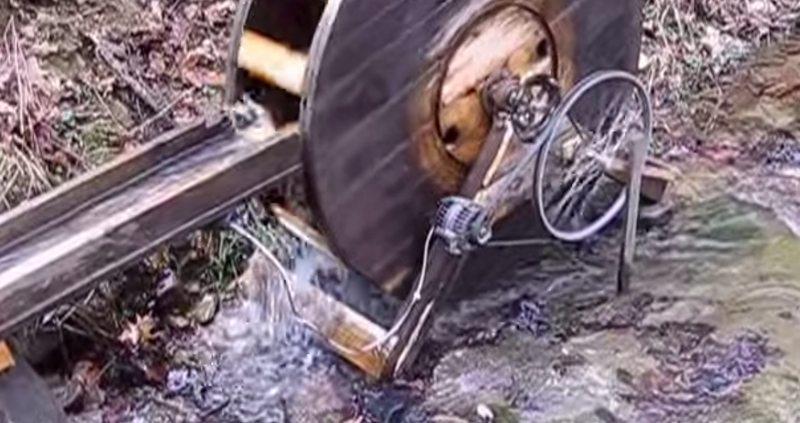 It’s basically a big wire spool converted it to a water wheel. The spool is bolted to two wheel bearings from a Chevy Cavalier, and a threaded rod goes through its center. On one side, a bicycle sprocket attaches to that rod, and drives a bicycle wheel via a chain. That wheel drives an alternator via what looks like a standard automotive serpentine belt. This isn’t a standard alternator, though. This guy had to do some clever mods so he wouldn’t have to power the thing to produce a magnetic field. Things are about to get nerdy for a second here. A regular alternator uses an electromagnetic rotor (see picture below), which must be fed a field current in order to yield a magnetic field. This “B Field,” when spun by an accessory belt, induces a current in the stator’s windings, and voila: you get power. The benefit of using an electromagnet versus a permanent magnet is that it’s easier to modulate the alternator’s voltage output by simply varying current to the windings in the rotor. Off Road/Off Grid doesn’t need that luxury, so he got rid of the electromagnets, and simply replaced them with permanent neodymium ones, which he won’t have to power in order to get juice from his alternator. Man, I could use a creek in my yard. What&apos;s The Oddest Thing You&apos;ve Ever Used Your Car For?